Lifestyle choices and avoidable factors contribute to more than 50 percent of cancer deaths, according to AACR status report. “Many of the greatest reductions in the morbidity and mortality of cancer have resulted from advances in cancer prevention and early detection. 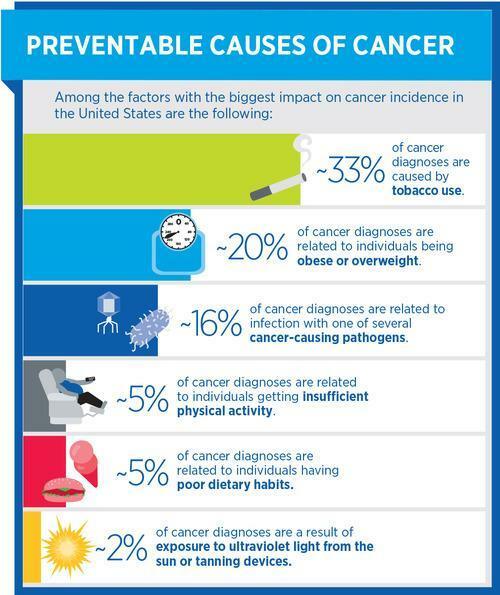 Yet more than 50 percent of the 580,350 cancer deaths expected to occur in the United States in 2013 will be related to preventable causes” the AACR report stated. It is certainly true that one can lower their risk of developing cancer, including cancer of the esophagus. Unfortunately, not all esophageal cancer diagnosis can be prevented. In fact, researchers currently do not yet know exactly what causes most esophageal cancers. However, the AACR does outline several risk factors that can attribute to a decrease in the risk of developing esophageal cancer. In addition to smoking, the report indicates that “obesity increases risk for a growing number of cancers, most prominently the adenocarcinoma subtype of esophageal cancer” along with a number of other cancers. Other known risk factors of esophageal cancer include Gastroesophageal Reflux Disease (GERD), which is also known as acid reflux disease (chronic heartburn), poor nutrition, excessive alcohol use and Barrett’s esophagus. Esophageal cancer, however, has not seen such decreases, cures or higher quality and longer life for those whose cancers cannot yet be prevented or cured. As the fastest growing cancer in the United States, esophageal cancer has instead seen an increase of over 600% in the past decades. Esophageal cancer is also one of the most deadly of cancers, with an overall 5 year survival rate of only 17.5%. What is worse is that there is no standard or routine screening to detect esophageal cancer in its earliest stages and symptoms often arise once the cancer has spread. This contributes greatly to the fact that esophageal cancer, which has no known cure, is often diagnosed in later stages reflecting on the fact that Stage IV esophageal cancer has a survival rate of only 3.8%. The culprit? A tremendous lack of public awareness regarding risk factors and symptoms, no standard or routine methods for early detection and very little government or private research funding allocated for esophageal cancer. As we continue to rally efforts in favor of awareness, early detection and research for esophageal cancer, we urge you to join this mission. Educate yourself regarding risk factors and symptoms of esophageal cancer and tell everyone you know. The more that people know about esophageal cancer, the better the chances of saving lives. Visit us on Facebook to help spread the message and invite your friends to “like” the page. To contribute directly to life-saving research projects, click here. Remember, only through awareness and precious research funding of esophageal cancer will we ever see a cure. This entry was posted on Tuesday, September 23rd, 2014 at 1:47 pm and is filed under The Salgi Foundation - Esophageal Cancer Awareness, Early Detection & Research. You can follow any responses to this entry through the RSS 2.0 feed. Responses are currently closed, but you can trackback from your own site.